Wolves, witches and giants all appear in the film adaptation of Stephen Sondheim’s popular musical which takes all the best bits of our favourite fairytales and mashes them together in one engaging, song-filled rollercoaster. However, musical movie adaptations are notoriously difficult to get right, from casting restraints to the inclusion of all the songs, transferring them to the silver screen is not something to be entered into lightly. So does director Rob Marhsall’s effort elevate itself above its peers? Into the Woods has numerous plot threads that all end up coming together in one way or another, but the main storyline follows a baker (James Corden) and his wife, played gloriously by Emily Blunt, as they come to realise they cannot have a child. Alas, a witch – who just so happens to live next door – has a way to provide them with what they want as long as they get a few items for her in the meantime. An all-star cast including the likes of Chris Pine, Anna Kendrick, Christine Baranski, Lucy Punch, Johnny Depp and of course Meryl Streep all give their all in a film that is brimming with tantalising cinematography and stunning songs. Generally speaking, the female cast fares better in the singing portions of the film, although Chris Pine and Billy Magnussen had the audience in intentional fits of laughter in one particular sequence as two handsome Princes. 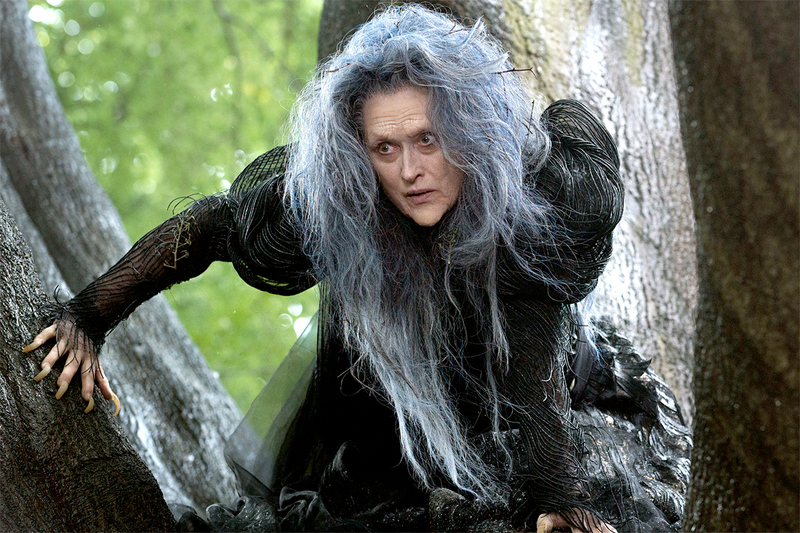 Unfortunately, Into the Wood’s greatest asset, its cast, is also its biggest undoing. Having so many story threads means that there isn’t any emotional attachment to the characters – despite the film’s numerous attempts to tug at the heartstrings. Despite a deeply heartfelt performance of ‘Stay with Me’ from Meryl Streep, the film just steadily rolls itself from admittedly thrilling set piece to set piece without getting bogged down in nitty gritty character development. Thankfully, the glorious cinematography that featured in the trailer continues throughout. An enclosed feeling makes you feel like you’re actually watching a stage show rather than a film, albeit one with a much higher budget, and this is one of its most captivating features. Director Rob Marshall has managed to keep the pantomime feel despite the fact the audience is watching in a cinema – the locations are never overdone and everything feels nicely claustrophobic, adding to the eerie atmosphere. However, the final act is unnecessarily long and its foray into deeper territory means the magic and sparkle is well and truly lost. This is a real shame as there are numerous moments where the film could end on a high, rather than delving into a murky and at times, incomprehensible final third. Overall, Into the Woods is a charming adaptation of the popular musical and despite its slightly overlong running time and a disappointing final act, it manages to stay on course for a perfectly adequate, if underwhelming finale. The entire cast have a ball with their characters with Meryl Streep and Emily Blunt being particular highlights throughout. Parents beware however, its PG certification may be slightly too lenient for smaller children, who will no doubt be intrigued by the premise of combining our most-loved fairytales. Overall: A fun if slightly overlong adaptation. I enjoyed this film and thought the intertwining stories worked well. Would agree with you that it was too long. The last part in which they were plotting to kill the giant felt like it was dragging on. Casting was brilliant; Emily Blunt in particular. Congratulations on your new role for the Lincolnite!